This past week has been crazy trying to keep up with these girls. Everyone has their own thing going on. It doesn’t help that I’ve become a bit hive crazy. No more, I’m done splitting and adding new hives. I’m up to five hives and one nuc. Just working now on building up the ones we have so we can get them through winter. The entries below explain all about our musical bees – swapping, splitting, adding, splitting. There really is some method to the madness. 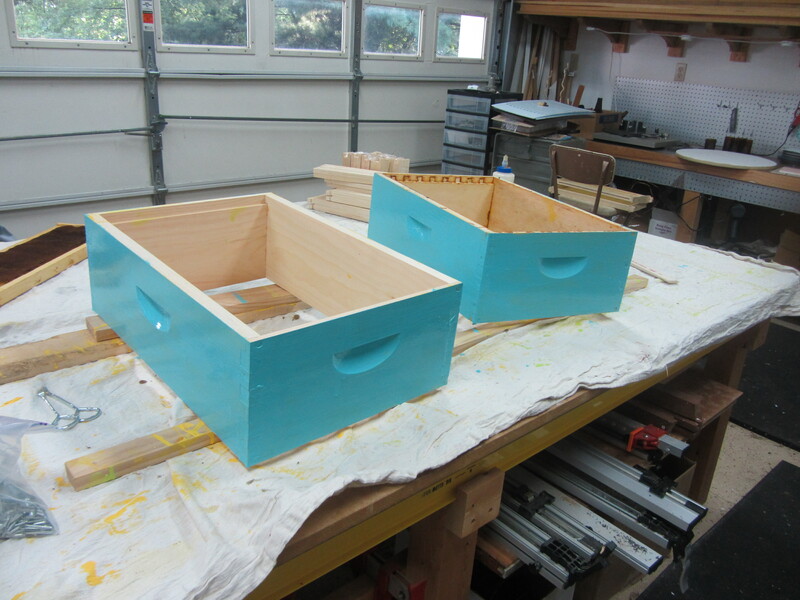 Last week I started Purple Hive from several Blue Hive frames. I knew it was a bad split and that they probably didn’t have enough resources to make a new queen. I was right. They’ve adapted to their new hive just fine, however they have very little brood and no signs of queen cells. It takes 24 hours for the queen smell to dissipate, at which point they realize they are queenless and will begin straightaway on producing a new queen. I checked around and there were no local queens available. I decided to bite the bullet and order another Texas queen for Purple Hive. I know, I know, I didn’t say nice things about the Texas queens in my last post – they’re a little temperamental, but they’re available, and darn if they’re not hearty and productive and bred to bee mite resistant. Anyway, the real cost is shipping the little buggers 3-5 day USPS. However, 2-3 queens can be purchased for the same shipping fee, so it makes sense to order multiple queens. Who knows, Blue Hive might need a queen! My queens arrived on Saturday. Actually they arrived Friday, but I didn’t know it. I had called the post office the day prior and asked that they not leave the bees in our mailbox. They didn’t leave the bees in the mailbox, but they didn’t drop them off at the house either. Instead, they held them at the post office and left messages on my cell phone, which I never check during the day because I can’t get cell phone reception at my work. Doh! So I worried all evening and into the morning until my perfect hubster picked them up and reported that everyone was alive and kicking. Yay! I wanted to get my new royals into the hives that same Saturday evening. As planned, I installed one queen in Purple Hive. Easy peasy. Then I opened Blue Hive and found fresh brood and larvae. Blue Hive had a new laying queen. Good news, but that left me with a hive less queen. Luckily I had planned on that as a possibility and had the hubster lower down the nuc that we’d set as a bait hive. It had 5 new frames and was ready to go. I pulled several frames from yellow hive, which had gone from sketchy to crazy productive, and swapped them with several fresh nuc frames. I installed the queen cage and closed it up. But for the life of me, I could not find the correct entrance blocker for the nuc, so I ended up using one that was just a smidge too high, causing a very small gap between the boxes. Too small, I thought, for the bees to get through. I returned home in the evening after a meeting and went up to remove the entrance blocker. I noticed robbers slipping through the gap. I opened the top and I saw maybe 20 bees in the hive with the queen. They’d all drifted back to their original hive. Doh! Too dark to do anything about it, I went inside and lost another night’s sleep wondering when I’d get the chance to make another split, and hoping the queen would hold on for another day. My chance came at 6:30 am the next morning. I never work the bees that early, but it was beautiful and bright and warm outside, so I put on my suit, lit the smoker and got to work. 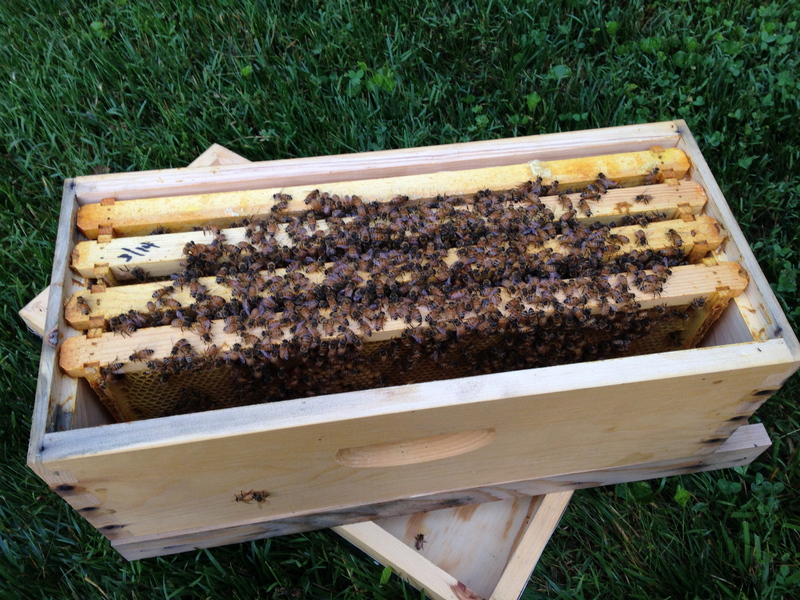 I pulled the queen and her posse from the nuc and they looked alive and very active. I set them aside and opened Green Hive. Another Carneolan hive, the bees were gentle and easy. I found several swarm cells (If I’d only known, I could have saved $83 bucks). They’ve been getting crowded, and having been over wintered, I suspect Green Hive may have swarmed since traffic has noticeably died down in front. Still lots of bees and they have brood. I took the top super, which still held mostly undrawn frames, and I placed it above the bottom box, splitting the brood chamber and giving the queen plenty more room to reproduce. 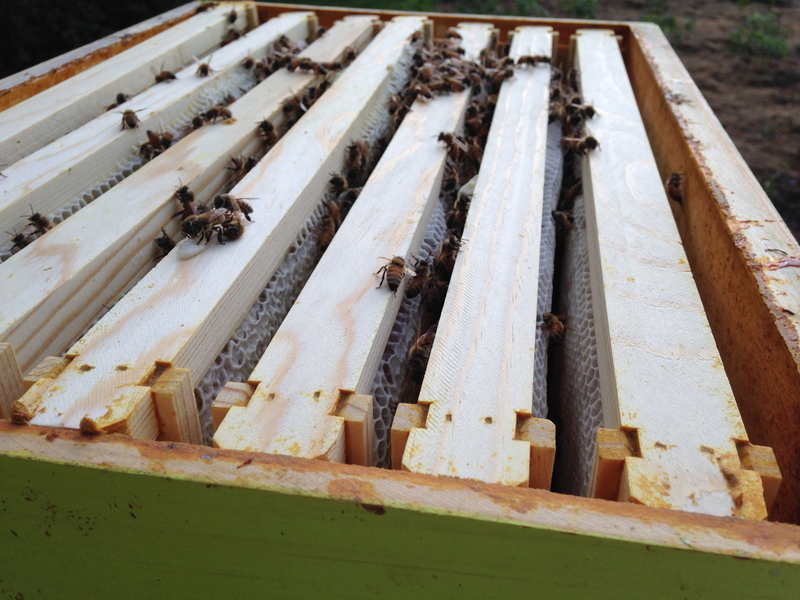 I pulled several frames of brood and placed them in the nuc, and replaced those with undrawn frames. The queen was installed in the nuc. The nuc was closed, and this time, I placed the correct size entrance blocker in the entrance. That started my day in a good mood! Purple Hive has released their queen! So much excitement and activity in that little hive of only 2 weeks. I suspect they’ll build up quickly with their new Texas queen. One super has been added to Yellow Hive. They’re my first year package hive, but they’re building up so quickly that I stopped feeding them several weeks ago and am hoping they produce some honey. Green Hive has produced more honey than anyone. The race is on for all the other hives to catch up! Yay, the nuc has released their queen! I unblocked their entrance and placed some branches in front so they can reorient. Now we’re in “hurry up and wait” mode. I’m hoping they build up enough over the next month to get themselves through winter. Come mid July, all of the bees will begin winding down and their focus will be on preparing for winter – less reproduction, less drones, less nectar and pollen as dirth sets in, and more stashing away stores and honey. I pick up another order of boxes and frames this weekend. 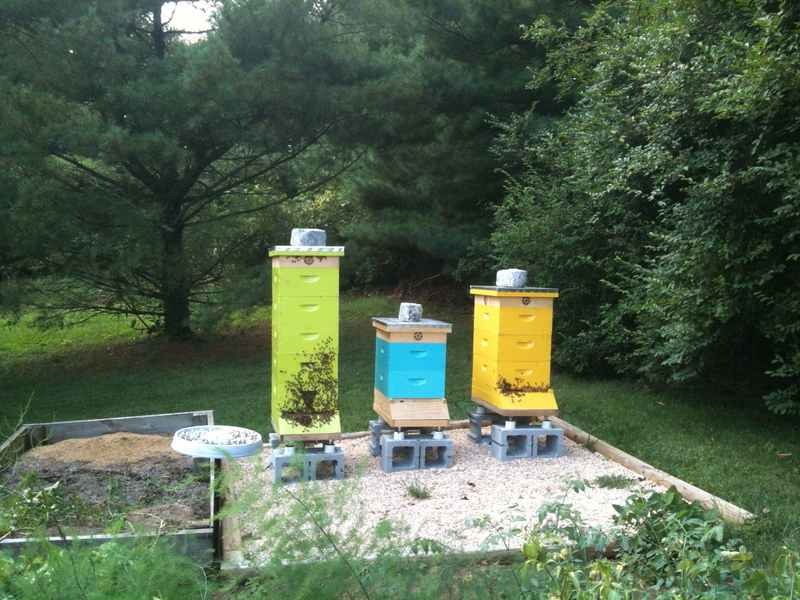 Once those are assembled, we’ll add a few more supers onto the larger hives. That should sustain them through my vacation. Yes, I am going on vacation and leaving the hubster with the bees! I would take him with me, but he has a small business to run, so I’m going on a trip with my dad to visit and take photos of his last 4 state capitols – a project that’s been in the works for over 30 years. I shall report the hubster’s events upon my return. Happy beekeeping! Our first swarm and we lost our bees. I was so upset. The hubster stayed outside and was piecing together the conduit contraption that he rushed out to buy. If I’d kept watch, as I’d been tasked to do, I would have seen where they went, but in the heat of the moment I ran off to seek a last resort and returned to an empty branch and no bees. I went upstairs to post a message to my bee club when the hubster yelled for me to come back outside, “hurry”! I ran like the wind and saw the cloud of bees erupting from above the trees, just a few feet below their original site. They’d settled behind some bushes where we couldn’t see them. 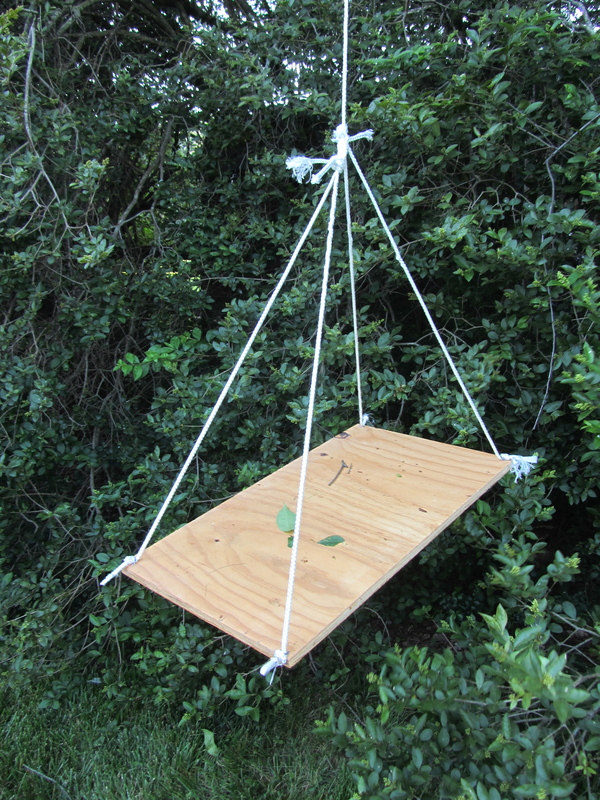 This time we sprang into action and began work on a swarm trap. Using an old computer box, I inserted one frame of brood comb and used some nails to tack it in place. We taped the lid closed and carefully taped every visible seam and opening. One hole was left open as the entrance. I added several drops of lemongrass oil at the entrance as the lure. 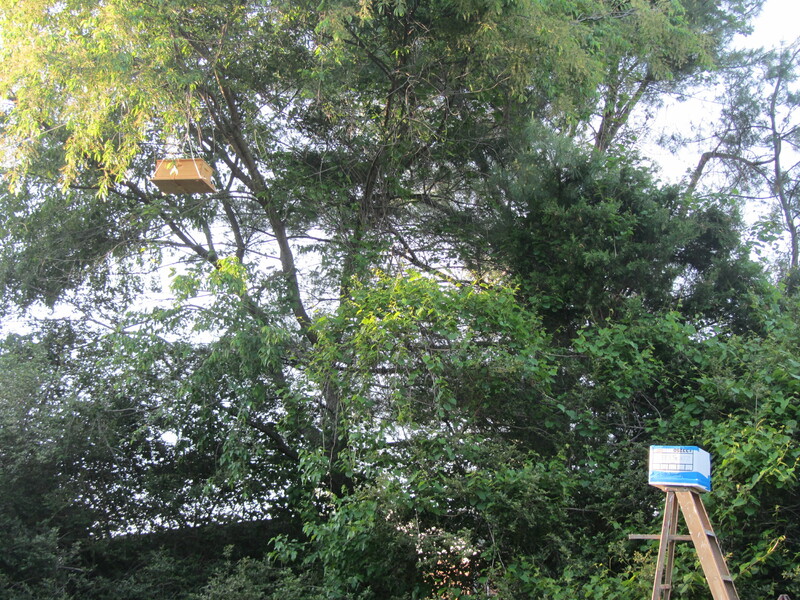 We then adhered the box to the top of a ladder and set it below the swarm’s location, just outside the dense shrubs. Then we watched and waited. We sat outside and wheels kept turning and turning. 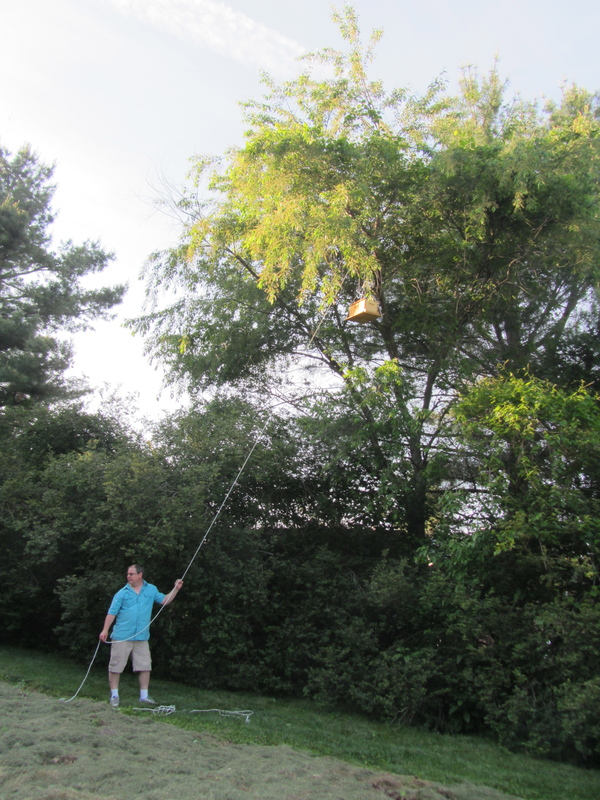 I watched YouTube videos on how to make swarm traps, and the hubster was thinking about how to hoist the bait trap higher in the tree and closer to the swarm. I knew the lightbulb came on when he jumped up and ran into the workshop. Ten minutes later, he emerged with another contraption. A platform piece of wood tied at the corners with rope and attached to a long piece of rope that was weighted at the end with some heavy metal hardware. After watching the Fat Bee Man make a swarm trap from a nuc, I ran to retrieve my nuc. Two bait traps have gotta be better than one. Using a Q-tip, I applied a ring of lemongrass oil around the inside of the box and added 5 new foundation frames. 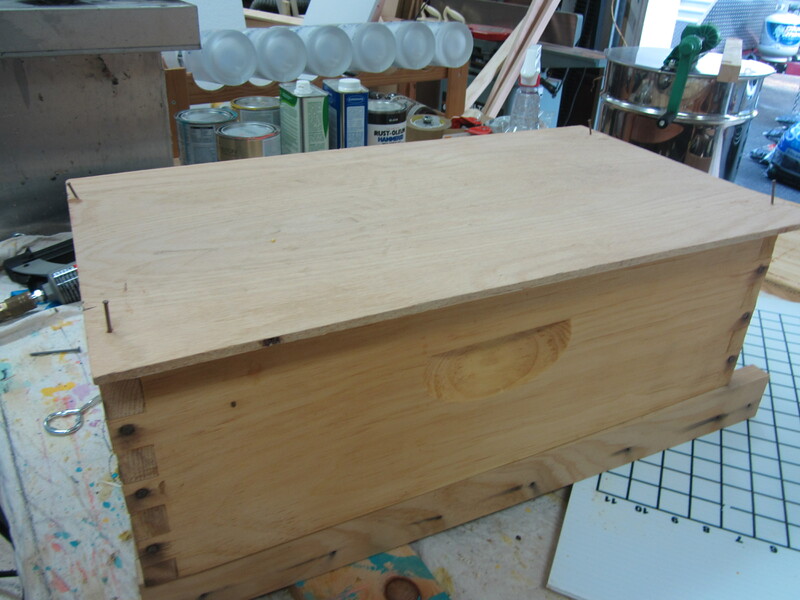 The hubster nailed on a flat plywood cover, and I added the entrance reducer and bottom board. The hubster finally managed to hoist the rope over a high branch.We adhered the nuc to the platform, the began lifting it higher and higher, til it reached bee height. 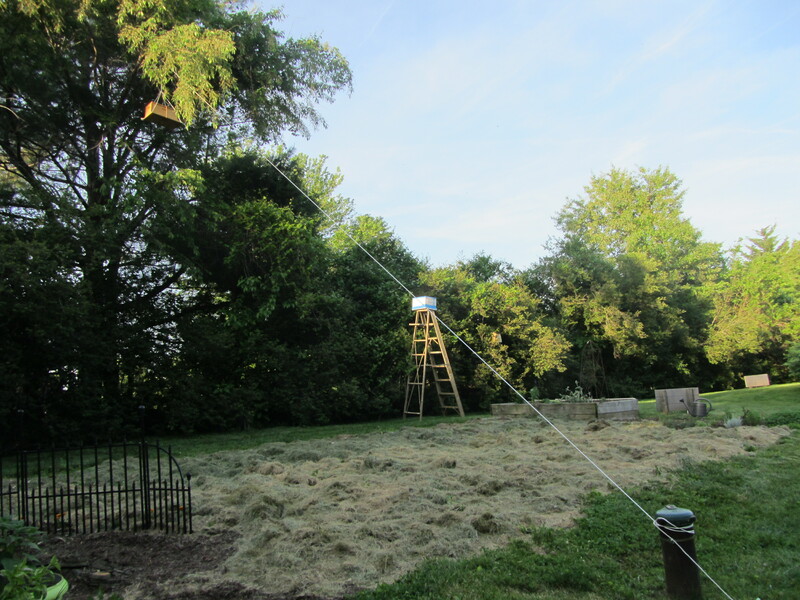 We tied the rope to our well pump. Now we had two boo bee traps! Baby nuc has been flourishing. They’ve been feeding well, growing in population and actively keeping up with their larger neighbors. I decided they’ve earned an upgrade. 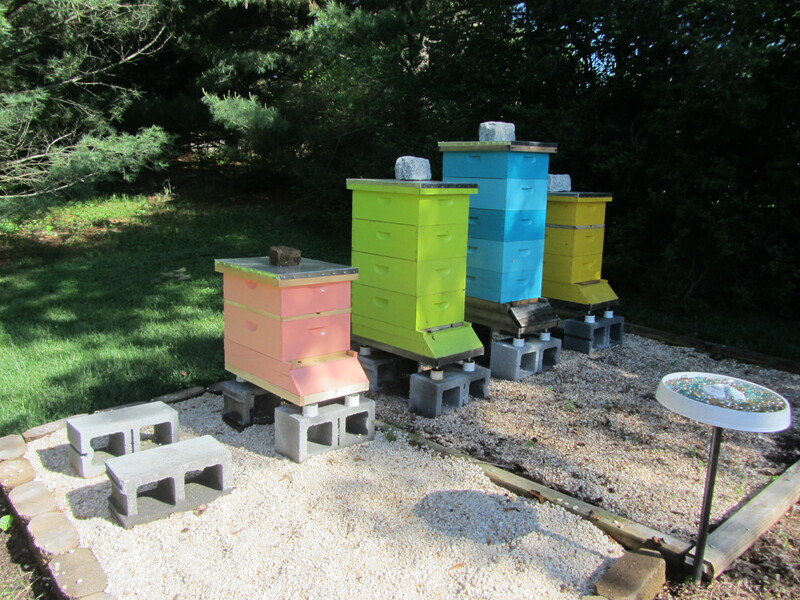 So welcome our newest member of the BooBee Apiary…. 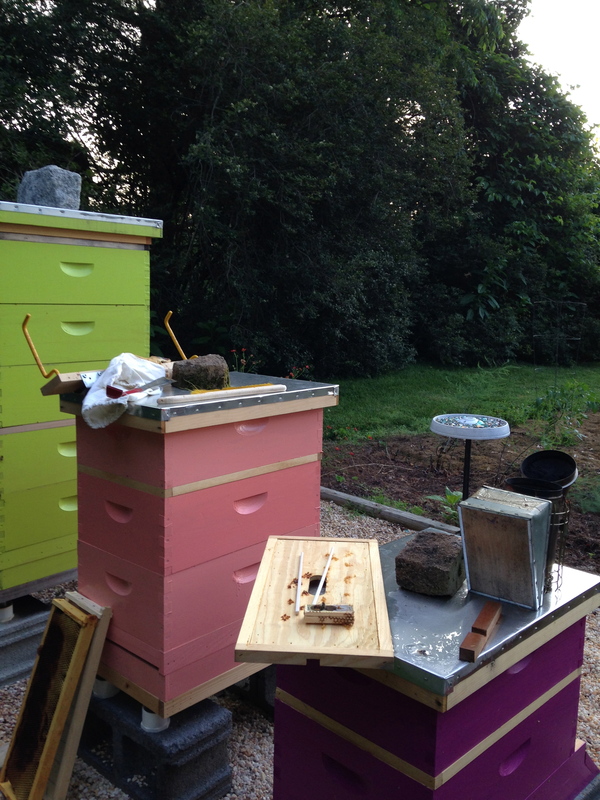 (drum roll)……Pink Hive! Salmon pink to be exact. She adds quite a splash to our already colorful configuration. As I transferred frames from Baby Nuc to the new 8-frame hive, I looked for and did not find the queen cell that hung so prominently from the bottom of one of the frames. This gives me every reason to believe that the virgin queen has hatched. Unfortunately, I was in a bit of a hurry, so I did not inspect the frames as I made the switch. It’s been 2 weeks since the cell was placed in Baby Nuc, so I’ll give her another week before checking for new brood. By that time the queen will hopefully have completed her mating flight (if she hasn’t already) and returned safely back to the hive to begin laying up a storm. 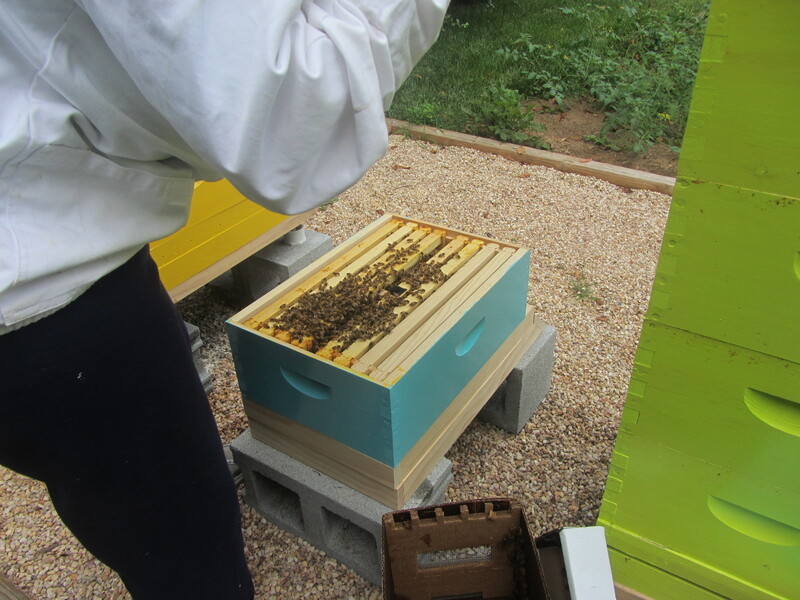 We’re excited to have a fourth hive in place, and now that Baby Nuc is freed up, I’m planning one more split in the coming weeks. Need to start thinking about that next color…hmmm. 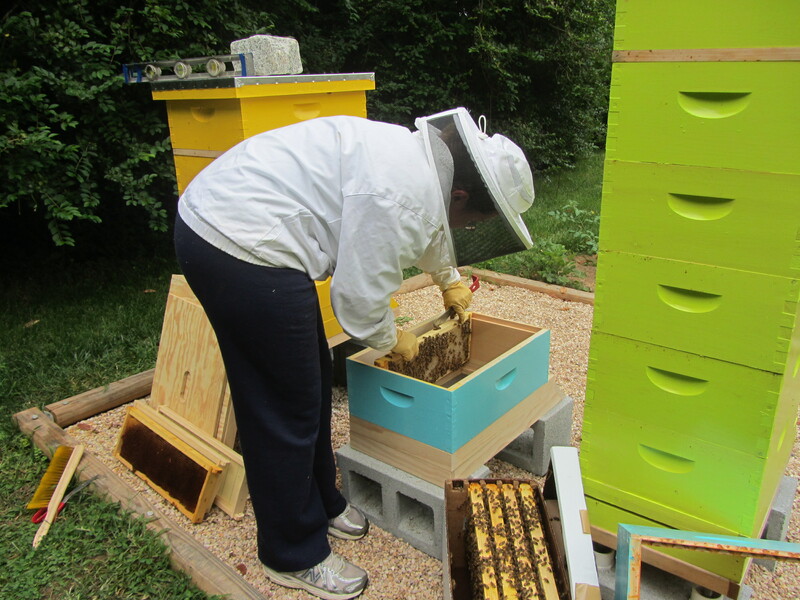 With the addition of Baby Nuc and the continuing growth of Blue Hive, we decided to move the raised bed and make room for two more hives. I even went out and purchased two new hives, just to be prepared. It’s always good to have extra hive bodies and frames around, especially during swarm season. 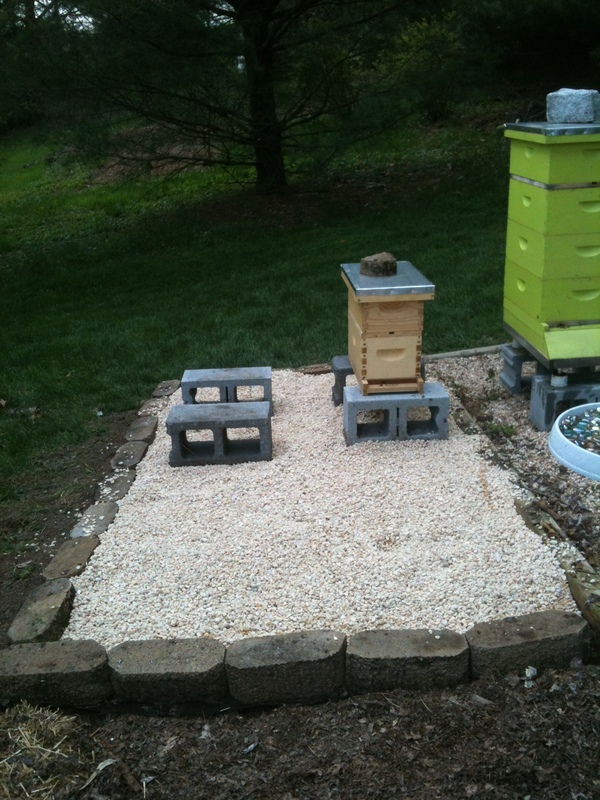 We lined the ground with landscape fabric (while dodging some testy bees) and leveled it out with pea gravel. Poor Baby Nuc was moved a few times, and we’d come back to their spot to find bees flying around wondering what happened to their hive. Needless to say, we worked fast and safely returned Baby Nuc back to its original location, and the aimless foragers landed on the front porch, happy to have found their missing home. 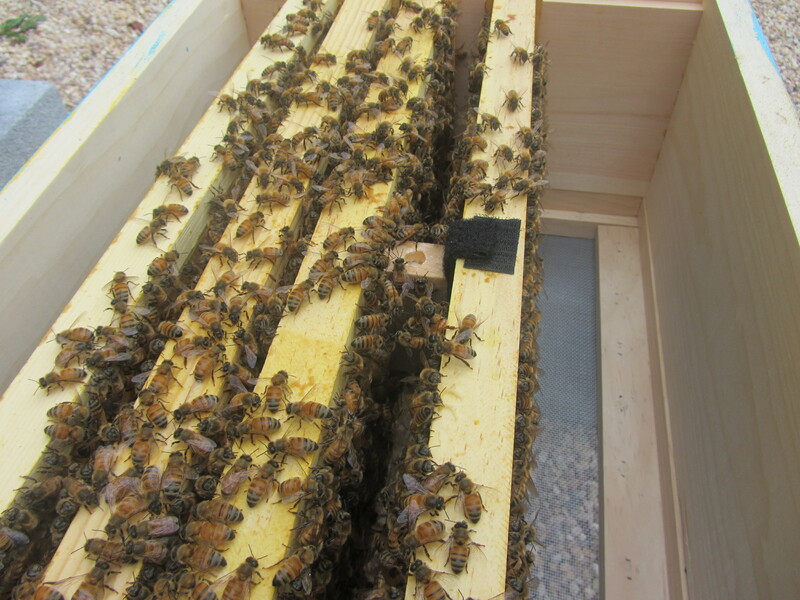 As we prepped the new area, I peeked in Baby Nuc to see if they’d created any queen cells yet. 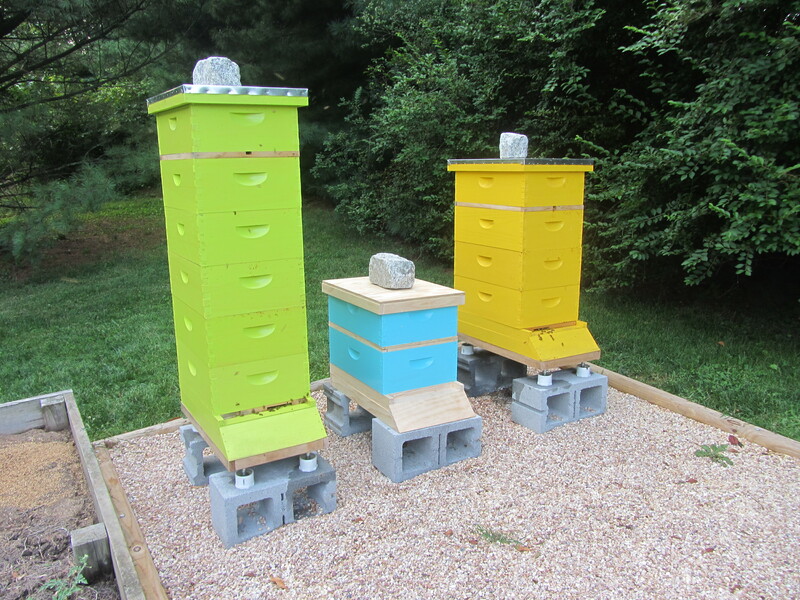 Baby Nuc was created with some nice frames of brood and larvae from Blue Hive. But I wasn’t sure whether I’d provided the eggs they needed to produce a new queen. I was told that after bees are separated from their hive and placed into a new queenless colony, it takes 24 hours for their queen’s smell to dissipate. When that happens, they acknowledge that they are queenless and begin working immediately to create new queen from the most newly laid eggs. During my inspection, I saw drone cells and burr comb, and at the bottom of one frame was a small and undistinguishable queen cell. Not what I was hoping for. Small is not an issue. Even small queen cells can yield good queens, but I wasn’t even sure it WAS a queen cell. I’d continue watching them and if they hadn’t created a queen cell in another week, then I’d simply give them another frame of brood, larvae and eggs from Blue Hive. That is, unless Blue Hive had a queen cell to spare. Then I could transfer the queen cell to Baby Nuc and all they’d have to do is feed it and wait for the virgin queen to hatch, mate and start laying eggs. This process usually takes about 4 weeks. The good news – Not only is Blue Hive incredibly active, laying up a storm and packing in tons of bees, they’re also laying lots of drones and (drum roll please)…queen cells! Score! Free Texas queen offspring for Baby Nuc. 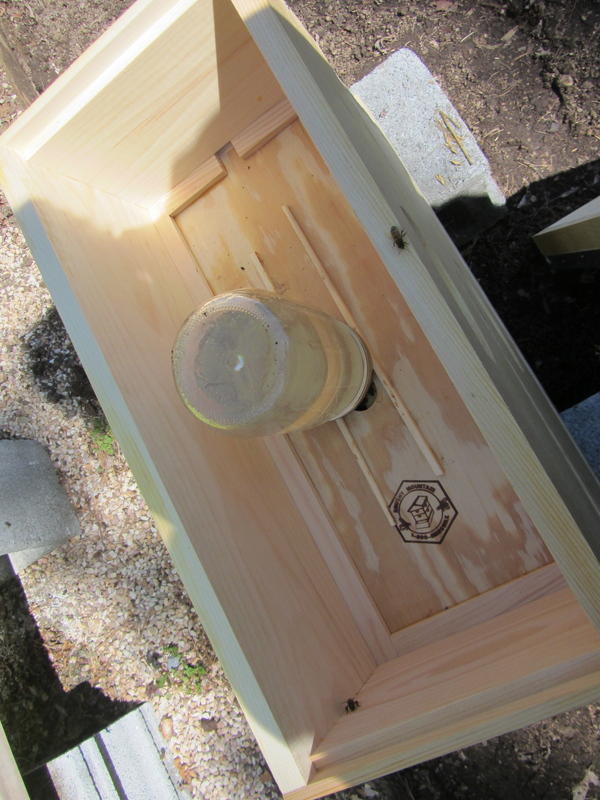 I shook the bees off and happily placed the frame into Baby Nuc. The cell was close to 1-1/2 inches long. Perfect! The bad news – Blue Hive has swarm written all over it. 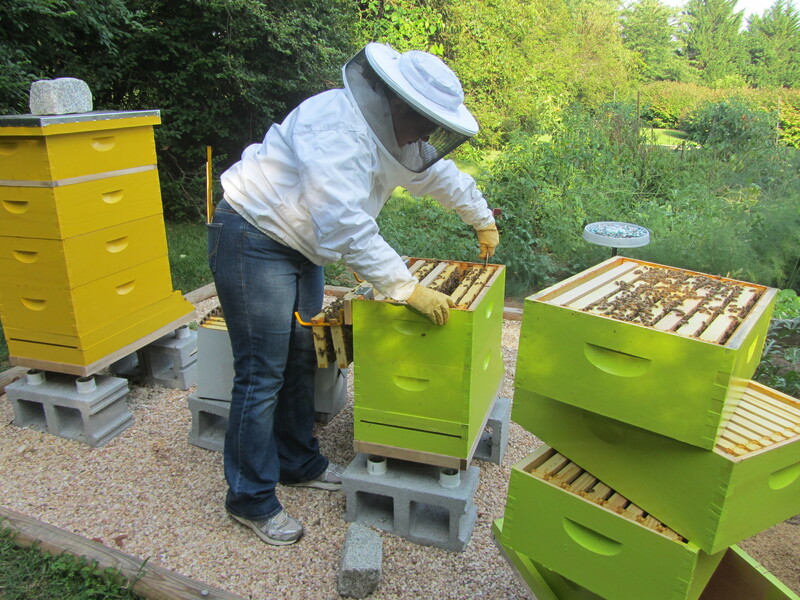 When purchasing my hives, I met up a bee club member who is a professional beekeeper. He said that when honey meets brood, they’re preparing to swarm. All of the above mentioned signs, combined with the fact that Blue Hive has outgrown its space and the brood is definitely meeting the honey, tell me that these girls are ready to swarm. My plan is to give them a proper split into one of the new hives. 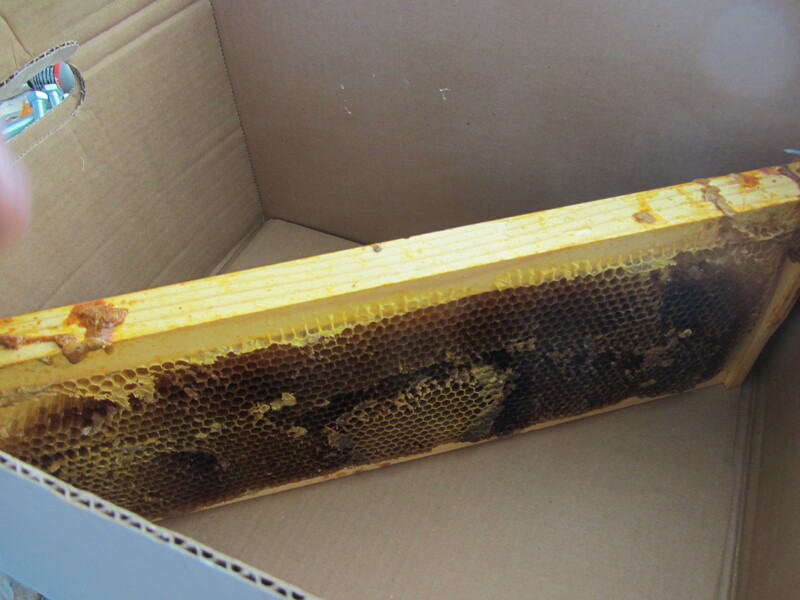 But first (as suggested by my beekeeper friend), I placed a full box of drawn comb beneath the top honey box, separating it from the brood box. This gives them room to expand and will hopefully prevent swarming for the time being, at least until I can get a good split from them. Yellow Hive looks great. I gave them a new box last week, so they’re working on filling that out. They’re laying, feeding, and doing all the things that a healthy and active new colony should be doing. I’m happy that Green Hive has perked up and is doing well. Like Yellow Hive, they’re laying, they’re active, and they’ve filled in their two boxes, so I gave them a third box of drawn comb to grow into then I closed them up. I’m feeling good at the moment and am especially excited at the prospect of adding more hives to the apiary. Even more exciting, the supers will go on this weekend and we’ll start collecting honey. Yay for honey! It’s good to have bees. Spring is already passing quickly and I’m falling behind on my reports. All three hives are doing well, but blue hive especially is bursting at the seams, perhaps ready for a split…or two to help prevent swarming. I’m seeing reports of swarms everywhere. They say happy bees swarm, so I guess its a good thing, as long as you can retrieve them and place them back into your own hives. 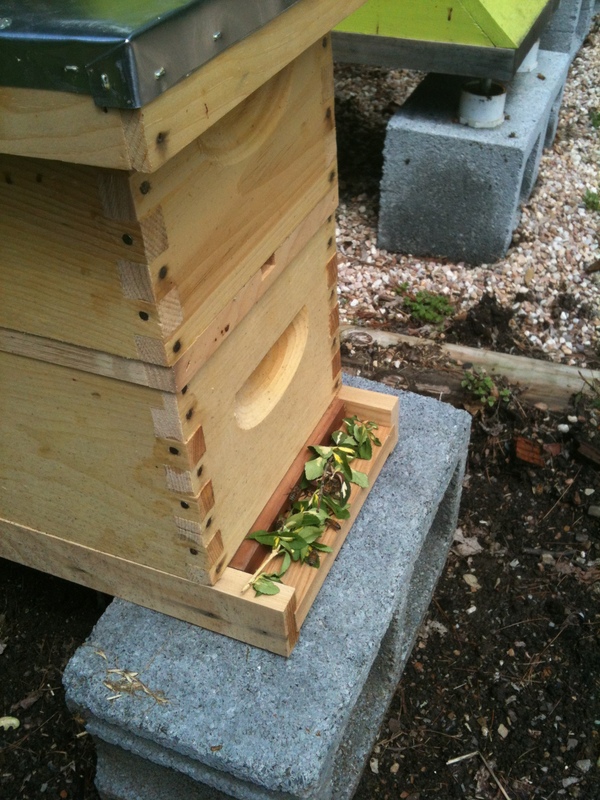 Green hive is just rolling along, not terribly active, not filled to the brim with bees, but doing ok. I suspect they had too much space over the winter and had a hard time of it, but they made it through. 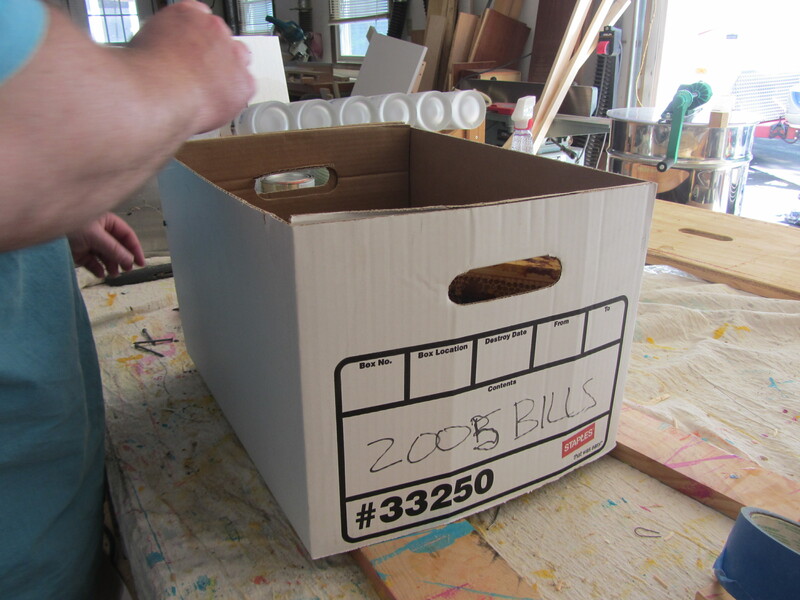 I reduced their boxes last week (04-19-14) from three to two, hoping that would reduce their stress levels by giving them less area to maintain. They weren’t filling the space anyway, and this configuration seems to suit their size and activity much better. I considered requeening, but decided against it. And I’m glad. Their numbers looked good. They were out and about, they had some brood, the laying pattern looked fine, few drones, all indicators that the queen is still going, albeit slow. When the time is right, they’ll make their own queen. Besides, if I spend money on a queen, I want another BeeWeaver Texas queen like I have in Blue Hive. What can I say about these little buggers? My little blue hive overwintered beautifully and has taken off. Tons of bees, they’re super active, a bit temperamental, but busy laying lots of brood and more drone comb than I care for. I fear this hive may be thinking about swarming in the near future. No signs of queen cells, but lots of drone laid in burr comb. So much so that the frames between the boxes are sticking together. I read that adjusting the bee space between boxes will help with this, but I don’t know how to fix the space between boxes. It is what it is. 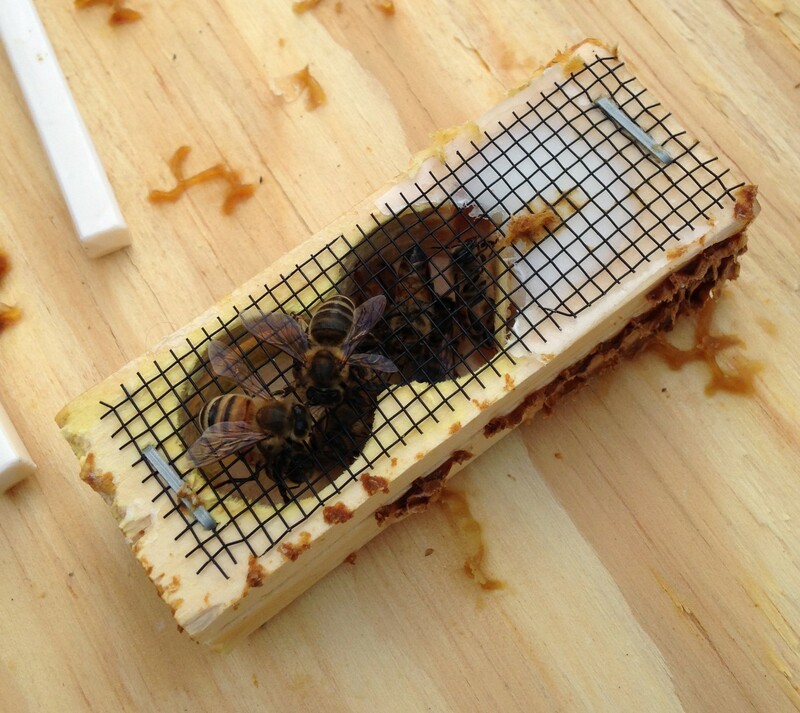 This is a great time to split the hive, start a nucleus (nuc) colony, and see if they’ll make a new BeeWeaver queen. I took out two bee covered brood and larvae frames (I probably should have taken more bees) from blue hive and replaced them with empty brood comb frames that I had in the freezer (pre-thawed, of course). I added the brood frames and bees to my nuc, surrounded by wet drawn comb frames and a full frame of honey. For feed, the hubster used his smallest size drill bit and drilled about 10-15 holes on the lid of a mason jar filled with sugar syrup. Worked perfectly. We’ll closed Baby Nuc for 24 hours. The following evening, I placed a branch in front of the nuc entrance and added the entrance reducer on the smallest setting. The branch will cause the bees to reorient themselves as they come out of the hive so they return to their new location rather than returning to their previous hive. You may also notice that Baby Nuc is not painted. I actually painted with with Linseed oil rather than paint. Important to keep an eye on the night time temps. If it looks like freezing, then Baby Nuc will come inside for the night. 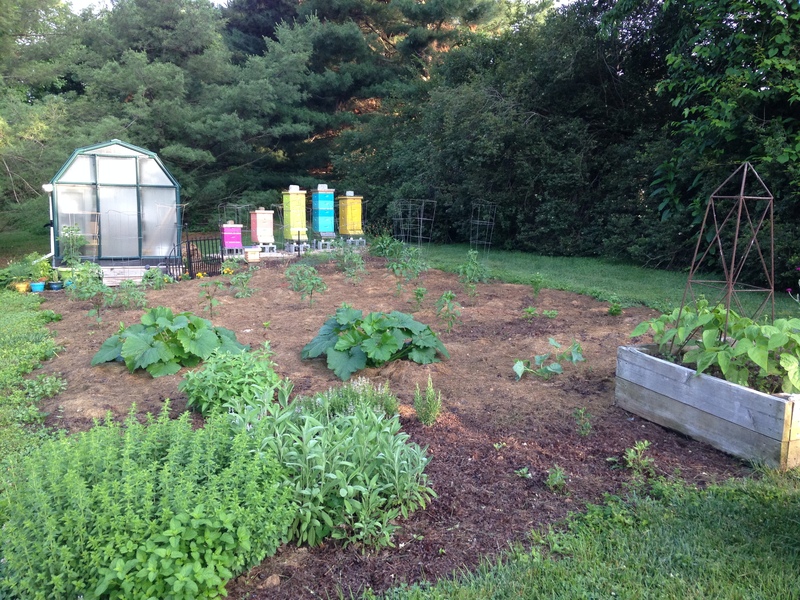 We moved our raised bed to make room for more hives. We now have space for two more next to our existing hives. If all goes as planned (which it never does, but if it does), Baby Nuc will transfer to an 8 frame hive, and I will split Blue Hive again using a much better method that I learned about AFTER making this split (of course). Lots of bees in blue hive. 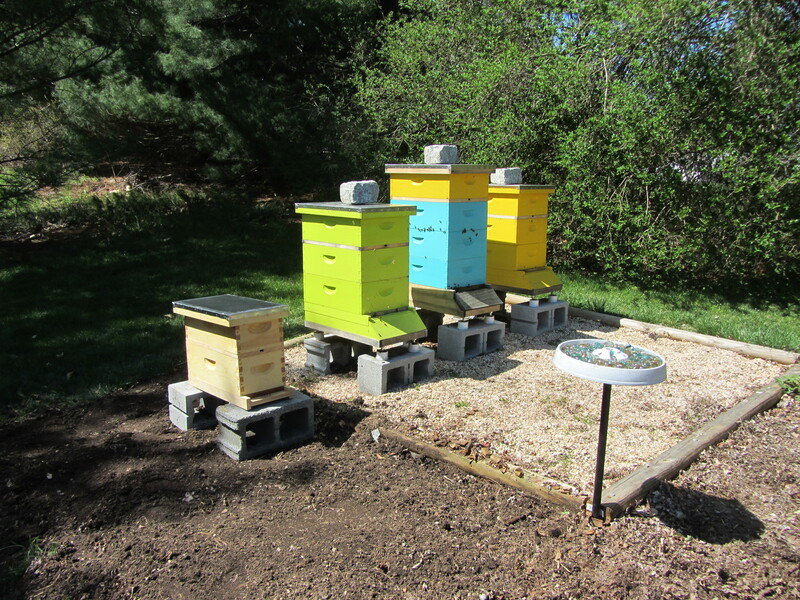 Of course, new hives mean new colors. Woo hoo! I have the paint selected and sitting in the workshop, ready and waiting to be revealed! The Girls have been very low key lately. They’re braving the cold nights and still going out and about during the day, gathering a surprising amount of pollen and storing lots and lots of sugar syrup. 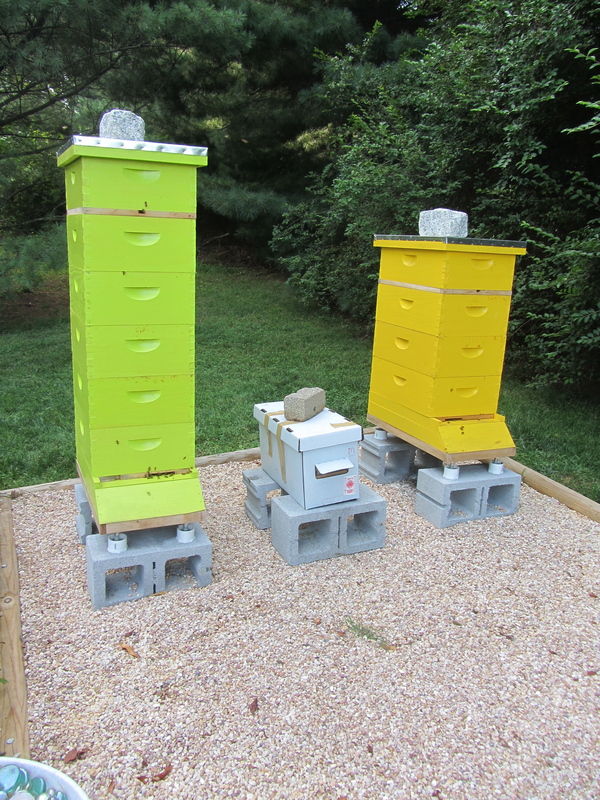 The top boxes on Green Hive 1 (GH1) and Yellow Hive 2 (YH2) are heavy! Yay for them. That’s been our goal all along – to get everyone through the winter. I’m happy to report that we’re all on the same page. The hubster got stung for the very first time while clearing out the garden. He’s officially one of us now. Part of the Bee Club. I’m sure he was standing in their flight path. He always stands in their flight path. I’d sting him too. He’s more sensitive than I am, so his feelings were hurt a little. After all, he does a lot for all of us girls. Surprisingly the sting under his arm didn’t bother him much. I was waiting for it to balloon up into an egg sized itchy bump so I could say ” I told you so!”, but it practically disappeared overnight. So unfair! Mine itch like crazy for days! All three hives are still taking in the sugar syrup as fast as I can make it. I mixed up a batch of syrup with Fumagillin – a medication to help prevent noscema. Noscema is a common disease for bees – similar to dysentery for humans – and occurs when they can’t get out for cleansing flights, mainly during winter. I was told that I’m late in giving them the Fumagillin, but the weather still has its warm spurts (in the 80s today) and the girls are out and about plenty, so I think we’re ok. Besides, better late than never. I’ll switch back to 2:1 syrup when the Fumagillin batch is consumed. 1:1 syrup is good for building comb and brood, but 2:1 will help them build winter stores. All three hives also have brood, but the brood production has definitely slowed down. Dead bees are collecting around the base of the hives. The girls are kicking out the drones. There’s no need to keep the men in the hives. They just hang out and eat all of the food. More will be bred in the spring when the girls need of them for mating. For now, there’s work to be done and much food to store. Even my little baby Blue Hive 3 (BH3) has stored quite a bit of syrup, and recently I’ve seen them bringing in large chunks of orange pollen. BH3 – 8-Frame Boxes or Nuc? I’m quite proud of BH3. They’re hanging in there. The top feeders have eliminated their robbing, however I did find a wax moth larvae. Can’t do much about wax moths except hope the cold weather freezes them out and the girls can fend them off. I’m still debating whether BH3 should overwinter in a nuc box. Two 8-frame mediums are not much larger than a nuc. I don’t have high hopes for BH3 making it through the winter, but I’ll wrap them up, feed them like crazy, and hope for the best. Hardly any hive beetles have emerged in YH2 over the past two weeks. 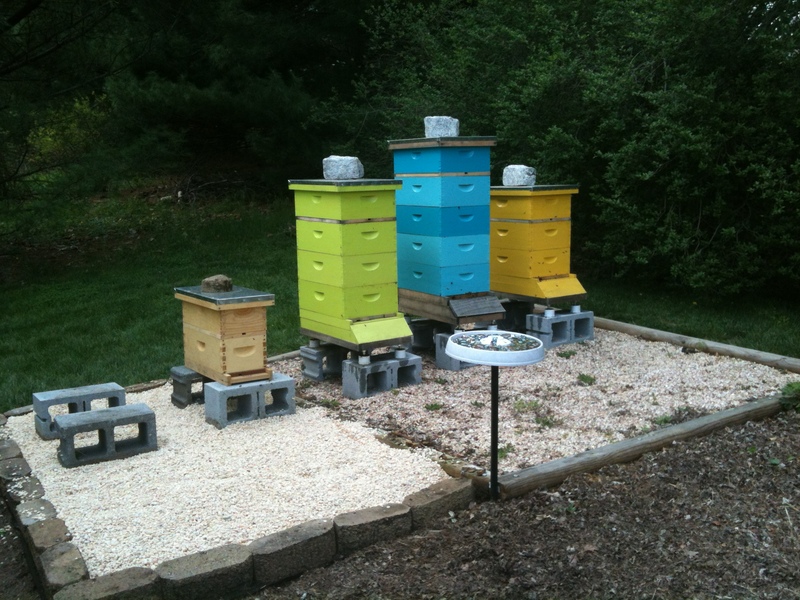 Diatomaceous earth is spread beneath all three hives to catch any dropping larvae. The Beetle Blasters caught a few, but haven’t made a huge difference. Maybe the colder weather has helped. Or maybe the ApiLife Var affects the beetles AND the mites. Ask 10 beekeepers a question and get 10 different answers. That definitely applies to winter preparations. Lots of decisions to be made. The hubster has built some prototype candy frames that can slide into the hives and feed the girls just like their sugar syrup frames. I’ll probably make candy boards as well. We’ll purchase roofing paper to wrap the hives. Some beekeepers crack the top covers to ventilate their hives during the winter because moisture from condensation is very bad for bees. I’ve also heard that 1-1/2 inch thick insulation board or foam board absorbs moisture and insulates the hives, so that’s another thought. Some beekeepers don’t wrap their hives at all. They leave it to the bees to survive on their own, just like in nature. One thing is certain, I will install mouse guards as soon as I get some ½ inch mesh. There’s just no telling what the winter will be like. Well, actually there is. We saw a woolly worm the other day. 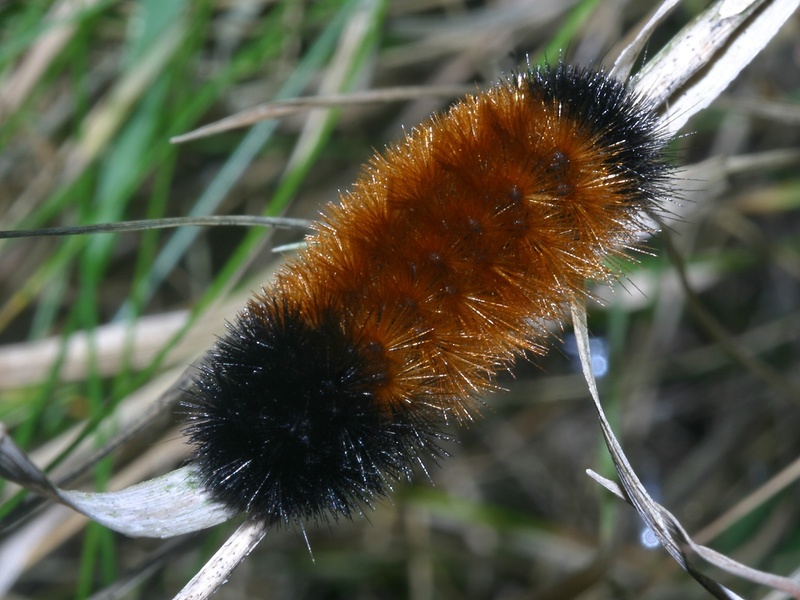 The width of the wooly worm’s brown center stripe is supposed to be a good indicator of how harsh the upcoming winter will be. The wider the stripe, the milder the winter. This worm’s brown stripe covered 1/3 of its body. So if the wooly worm is accurate, then the winter will be mild. Regardless, we’ve worked too hard this summer to slack or take chances. As with everything else, we shall prepare for the worst and hope for the best. Yellow Hive 2 (YH2) forced me to make yet another quick executive decision. This hive decided to requeen itself, which (thank goodness) we discovered just before we requeened the hive ourselves. This surprise left us with a beautiful $50 Texas Buckfast queen and no hive. So I decided to split GH1 since it is very strong and should quickly make up for any contributions to its new little sister hive. The night prior, I carefully went through the frames in GH1 and transferred two frames of honey and nectar, a frame of eggs and larvae, and two frames of capped brood to a nucleus hive, which is essentially a 5 frame box. I looked at every frame very, very carefully to make sure none contained the queen. I didn’t see her at all and suspect she was in the bottom brood box, safe from Beezilla. To get them acclimated to their new location, right between GH1 and YH2. If there’s no acclimation, then they may be inclined to return to GH2 rather than stay and prosper in BH3. I believe the transfer was a success. We let the bees rest in their new location until tomorrow when they meet their new queen. I was in the garage at 8:30 PM last night painting boxes, because our new addition must have its own identity. It must fit with our calypso, Caribbean colorfest in the garden theme. This new addition is completely unplanned. But then the girls have been driving this show since day 1, so I really shouldn’t be surprised by the curve balls they keep throwing at us. 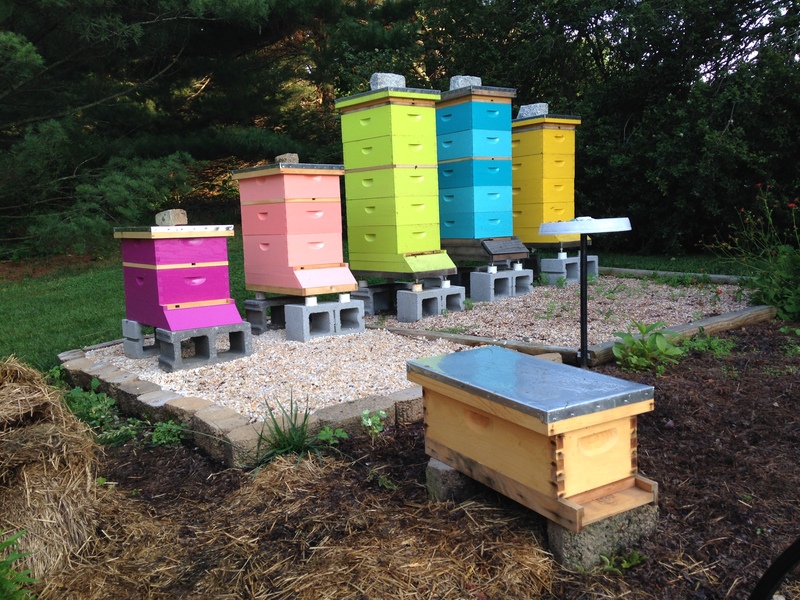 Ironic though that Blue Hive 3 (BH3) should become the newest member of our Boo Bee Apiary on Day 100 of this wild adventure. We had the two boxes all painted and ready to go, but no bottom board, launch pad, entrance reducer, inner cover or top cover. We drove to our bee supplier first thing in the morning and he was closed! Ugh! We needed a complete hive and FAST! Our queen wasn’t faring well in that tiny little queen cage and we needed to get her in today! My amazing and brilliant hubster offered to give up his play day with beer to build the pieces I needed to complete my hive. We visited Lowes and bought the supplies then quickly headed back home. While I made zucchini bread, he ripped out a top notch launching board, a screened bottom board, an inner cover and a top cover. His first time ever building these pieces, and as always he did a stellar job. 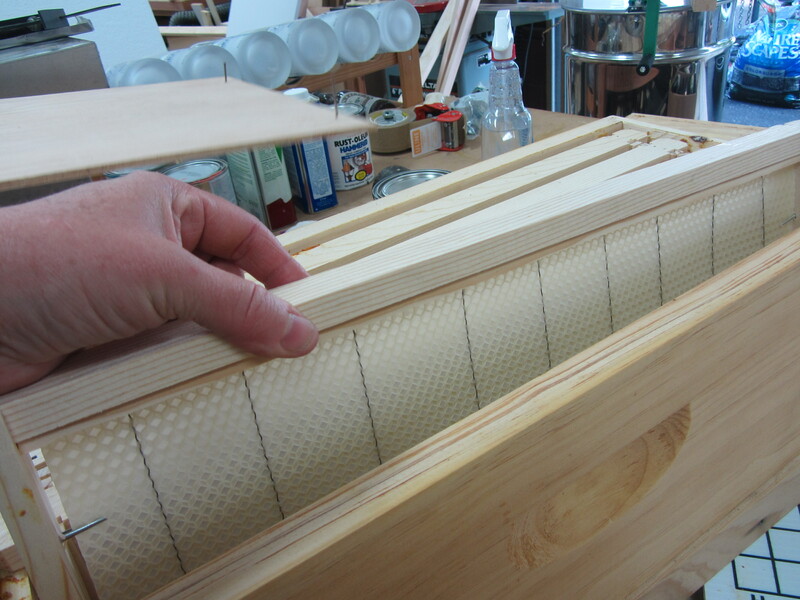 We did learn that unless you build in bulk, it is NOT cheaper to build your own hives and hive parts. I’ll stick with my bee supplier, when he’s open. Homemade is good for now. I decided to keep the hive closed in for another day, just to be sure they would be acclimated to their new location. So we placed a complete strip of wood across the hive entrance. I opened the nuc and was very pleased to see a very large population of bees. Just as I transferred my first two hives back in May, I moved the frames and placed them into the new hive in the exact same order. I added a strip of velcro to the queen’s cage, and placed the other half of the velcro on top of a center frame so she could hang between the brood frames. The velcro worked perfectly. We hung her between the frames, candy side up and screen facing out between the frames so the Queen could be attended to. I shook in the remaining bees and closed up BH3 leaving a boardman feeder in a second top box. Accidentally I left the feeder on top of the hive until I was ready. I walked away for 2 minutes and returned to a feeding frenzy. I shooed them away and proceeded to grab the feeder by the cup, collapsing the feeder and releasing syrup everywhere. It was a robber’s sugary dream. I managed to clean most of it up and rinsed the sugary areas with water. Lesson learned! I have to say that I’m actually proud of our split and how we handled the whole YH2 situation. Ok, so I’m not the most calm, cool and collected beekeeper; I still fumble around the hive; and yes, I lost a few winks of sleep worrying about the girls, but this whole scenario has taught me so much and I do love a happy ending. BH3 will be a bit of an experiment. We’ll baby it through the winter and hope for the best. If someone had told me this time last year that I’d have 3 bee hives, I’d have thought they were nuts. Pretty amazing really. Right now I think 3 is all we can handle. This increases our chances of getting a hive through winter, thus improving our chances for honey next year. Woo hoo!